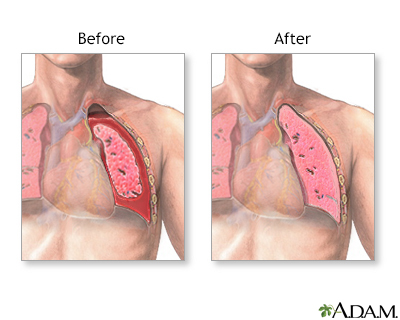 A collapsed lung occurs when air escapes from the lung. 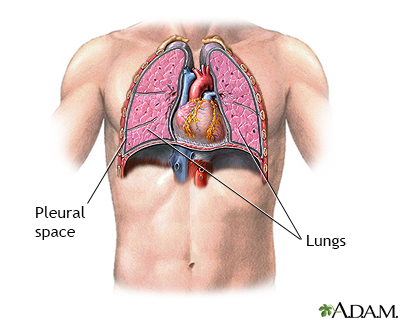 The air then fills the space outside of the lung, between the lung and chest wall. This buildup of air puts pressure on the lung, so it cannot expand as much as it normally does when you take a breath. The medical name of this condition is pneumothorax. 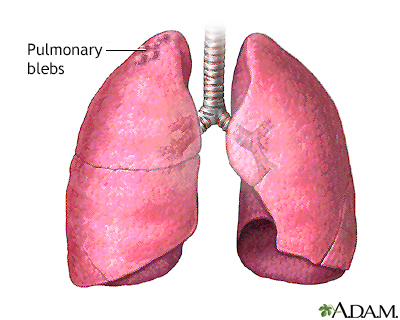 Collapsed lung can be caused by an injury to the lung. Injuries can include a gunshot or knife wound to the chest, rib fracture, or certain medical procedures. 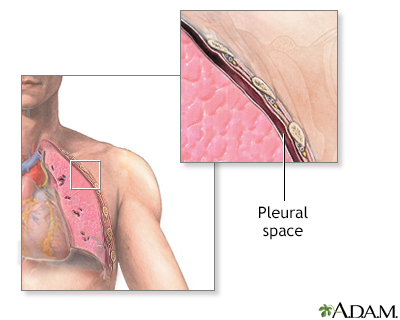 In some cases, a collapsed lung is caused by air blisters (blebs) that break open, sending air into the space around the lung. This can result from air pressure changes such as when scuba diving or traveling to a high altitude. Tall, thin people and smokers are more at risk for a collapsed lung. In some cases, a collapsed lung occurs without any cause. This is called a spontaneous collapsed lung. The health care provider will listen to your breathing with a stethoscope. 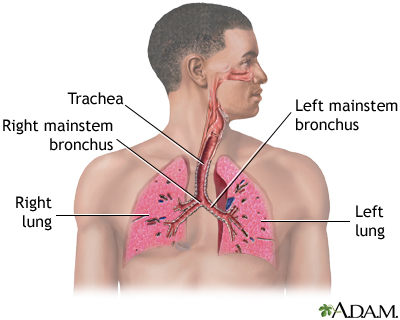 If you have a collapsed lung, there are decreased breath sounds or no breath sounds on the affected side. You may also have low blood pressure. A small pneumothorax may go away on its own over time. You may only need oxygen treatment and rest. 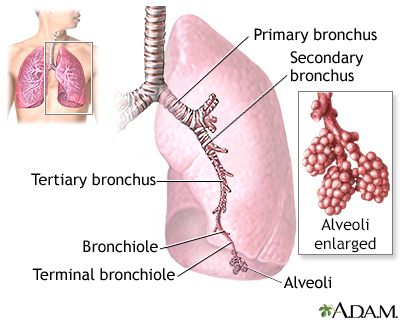 The provider may use a needle to allow the air to escape from around the lung so it can expand more fully. You may be allowed to go home if you live near the hospital. 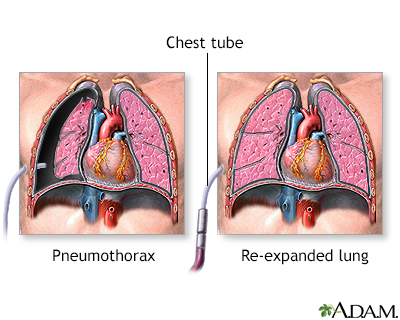 If you have a large pneumothorax, a chest tube will be placed between the ribs into the space around the lungs to help drain the air and allow the lung to re-expand. 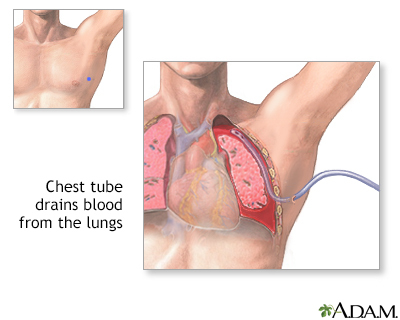 The chest tube may be left in place for several days and you may need to stay in the hospital. If a small chest tube or flutter valve is used, you may be able to go home. You will need to return to the hospital to have the tube or valve removed. Some people with a collapsed lung need extra oxygen. Lung surgery may be needed to treat collapsed lung or to prevent future episodes. The area where the leak occurred may be repaired. 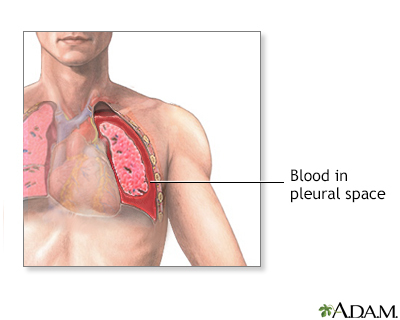 Sometimes, a special chemical is placed into the area of the collapsed lung. This chemical causes a scar to form. 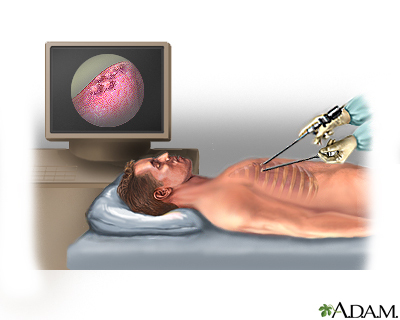 This procedure is called pleurodesis. How well you do after having a collapsed lung depends on what caused it. Call your provider if you have symptoms of a collapsed lung, especially if you have had one before. Byyny RL, Shockley LW. Scuba diving and dysbarism. In: Marx JA, Hockberger RS, Walls RM, et al, eds. Rosen's Emergency Medicine: Concepts and Clinical Practice. 8th ed. Philadelphia, PA: Elsevier Saunders; 2014:chap 143. Eckstein M, Henderson SO. Thoracic trauma. In: Marx JA, Hockberger RS, Walls RM, eds. Rosen's Emergency Medicine: Concepts and Clinical Practice. 8th ed. Philadelphia, PA: Elsevier Saunders; 2014:chap 45. Light RW, Lee YCG. Pneumothorax, chylothorax, hemothorax, and fibrothorax. In: Broaddus VC, Mason RJ, Ernst JD, et al, eds. Murray and Nadel's Textbook of Respiratory Medicine. 6th ed. Philadelphia, PA: Elsevier Saunders; 2016:chap 81. 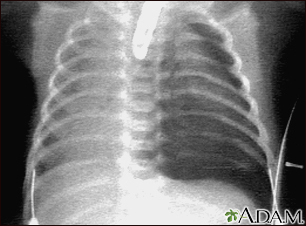 Aortic rupture (a tear in the aorta, which is the major artery coming from the heart) can be seen on a chest X-ray. In this case, it was caused by a traumatic perforation of the thoracic aorta. 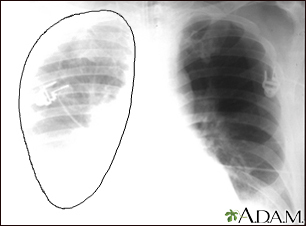 This is how the X-ray appears when the chest is full of blood (right-sided hemothorax) seen here as cloudiness on the left side of the picture. 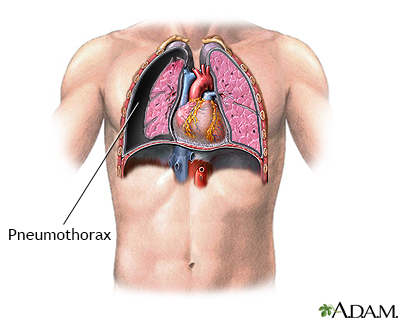 Pneumothorax occurs when air leaks from inside of the lung to the space between the lung and the chest wall. The lung then collapses. 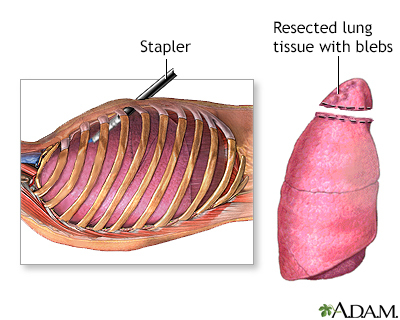 The dark side of the chest (right side of the picture) is filled with air that is outside of the lung tissue.